Riding a bike has always been a love of mine. It’s hard for me to understand why everyone doesn’t enjoy it! Of course I had the 70’s chopper-style bike w/ a glittery banana seat when I was in grade school (like a lot of other kids). I remember begging my Dad on weekends to take my brother & I on bike rides around the neighborhood, & he did – it never got old! Graduating a few years later to a Schwinn 10 speed, I rode that thing everywhere I needed to go. I told my Dad, “I’m never going to need a car. I’m just always going to ride a bike!” Sometime later, I exuberantly ran a stop sign which resulted in my first ticket before I even had a driver’s license. Needless to say, I have changed my ways & obey the rules of the road on my bike & yes, my car. Fast forward to 2005: I started riding w/ two girlfriends on Wednesdays. That was the only day we could make time for riding since we had work & kids to shuttle around. I only rode that one day a week ( & sometimes that didn’t even happen ) until 2009 when I joined a local bike club & started riding on Saturdays also. That’s when I realized, “I need to step up my game!” I became more & more brave, riding other days of the week w/ more people & signing up for Century Rides in the area. Over the past 4 years I’ve ridden the Poway Century, Bike The Coast, San Diego Gran Fondo (x3), San Diego Century (x2), Palm Springs Century (x3), El Tour De Tuscon, Borrego Century (- last 10 miles, oops!) Santa Barbara Metric Century (x4), Temecula Metric Century & most amazingly to me, an informal Double Century, riding from Santa Barbara to Oceanside in a day! To sum it up, I’m really happy to be a part of Team Fun. 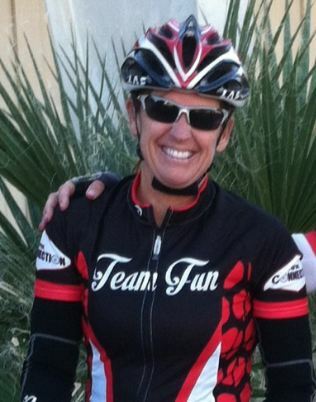 My goal is to spread “cycling love” to other ladies & have fun riding around together in San Diego County & beyond! P.S. Strava is VERY fun – If you don’t use it, you are missing out!